twelve introductory chapters and then introduces protocols and their theoretical background relevant for experimental research. 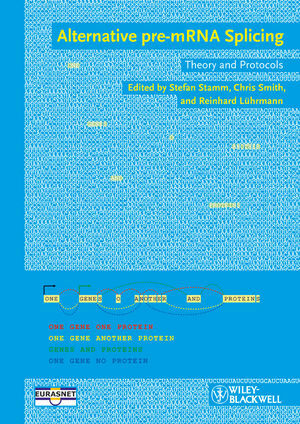 These 43 practical chapters cover: Basic methods, Detection of splicing events, Analysis of alternative pre-mRNA splicing in vitro and in vivo, Manipulation of splicing events, and Bioinformatic analysis of alternative splicing. A theoretical introduction and practical guide for molecular biologists, geneticists,clinicians and every researcher interested in alternative splicing. the aim to apply the fi ndings to the Prader-Willi Syndrome and Spinal Muscular Atrophy. Chris Smith is Professor of RNA Molecular Biology in the Department of Biochemistry at the University of Cambridge. His PhD research in Biochemistry was carried out at the University of London, followed by postdoctoral research at Harvard Medical School. His research interests encompass the mechanisms, regulation and function of alternative splicing. for Molecular Genetics in Berlin. His research focuses on the structure and mechanism of the spliceosome.